TAP teachers exploring the Memorial to the Murdered Jews of Europe in Berlin, Germany. Minooka TAP was born in 2007. There were five teachers in the initial group – Miss Massey (8th grade literature), Miss Hanley (3rd grade), Miss Rehn (the junior high librarian), Mrs. Bailey (8th grade social studies), and Mr. Curtis (6th grade language arts). Before they joined forces, Miss Massey and some of her friends were trying to come up with a way to make the ultimate field trip. Miss Massey and Miss Rehn had taken a trip to Japan and China the summer before and spent a great deal of time trying to figure out how to make this travel thing work for their kids at school. At the same time, Mr. Curtis had begun talking with a company called Smithsonian Travel – a subsidiary of EF Tours – about figuring out a way to take some of his 6th graders on educational tours of places like Washington D.C., New York, and Boston. 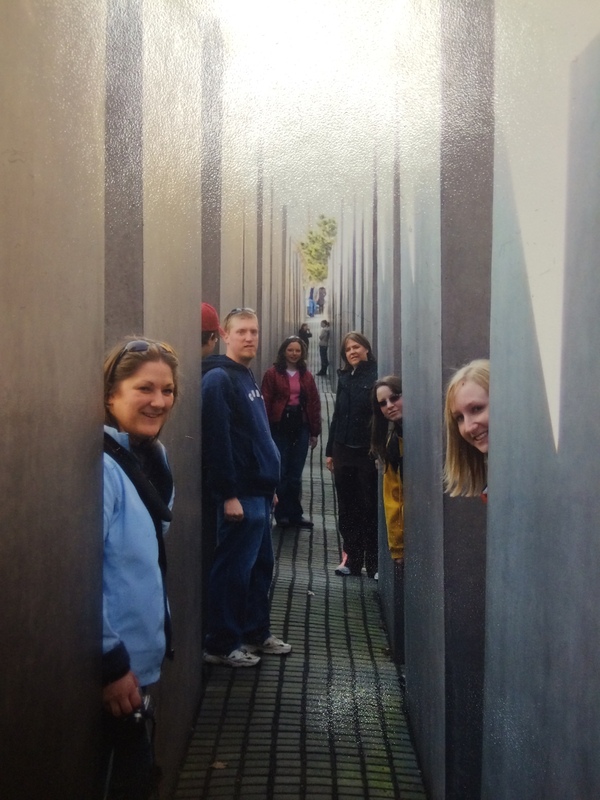 In the fall of the ’06-’07 school year, the two groups joined forces, selecting 24 students and a few parents and grandparents to travel with them to Europe over Spring Break. 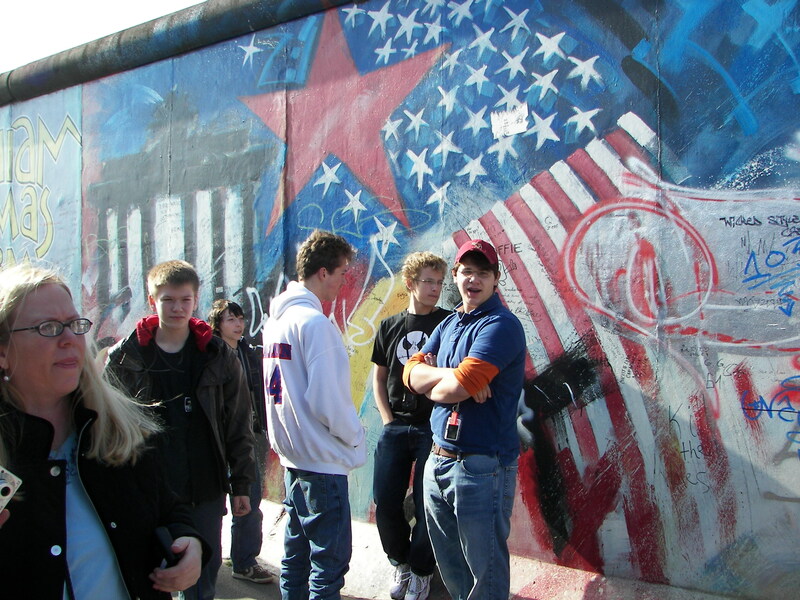 Germany was selected as the first destination, and at the time we thought maybe we’d go to Germany every year, because it ties so perfectly in to the 8th grade curriculum. In fact, most of the kids that traveled with us had Mrs. Bailey or Miss Massey for class, so they learned a great deal about WWII and the Holocaust during the school day. We did have meetings about once a month to prepare for the trip, plan a few fundraisers, and to discuss history and logistics of the trip. Berlin was the first city we visited, and it was incredible. We began with our tour director, Bernhardt, giving us a bus tour to give us an overview of the city and help us get our bearings. As we weaved our way through the streets, you could have gotten lost, but it was always easy to get an idea of where you were, because you could still tell – even 20 years after the Cold War had ended – where the dividing line between East and West Berlin was. The wall was gone in most places, but the East side was all drab, boring buildings built by the communist regime, while the West side was loaded with character – older buildings, churches, decoration. Eventually we got to stop and get out near one of the remaining sections of the wall. It was surreal for people my age and older to be standing there, having grown up during the Cold War. The Wall was always this dark symbol of evil in my mind, but now it’s really cool. The longer section we visited was filled with murals, dedicated to peace, painted by artists from all over the world. I could have walked down the sidewalk all day taking pictures of them, but there was tons more to see. While we were there, there was some sort of summit of European leaders taking place in Berlin, so we weren’t allowed to get too close to Brandenburg Gate. From a distance, though, it was both beautiful and intimidating. Because of the summit, there were armed guards patrolling the top of the wall, which gave most of the adults an eerie flashback to times before the Iron Curtain crumbled. Especially haunting was the opportunity we had to peek around the wall, seeing from the side how tall and impassable it really is – the back side isn’t full of colorful peace murals, it’s the same drab gray wall those stuck on that side looked at for almost three decades. The fields of barbed wire, the guard towers, and the open spaces where dogs and soldiers patrolled hit me hard. Checkpoint Charlie – the spot in the wall that American servicemen guarded from 1961 to 1989. The checkpoint became a symbol of the Cold War itself and was the site of Russian and American tanks facing off against one another briefly in ’61. Now, it’s a Kodak moment, where the true meaning and feeling of the place can never be truly explained to the TAP 8th graders, but they started to “get it” while we strolled through the Checkpoint Charlie museum, seeing the history of the Wall, the checkpoint, and the folks that tried to escape by crawling into car trunks, running past the guards, building baloons, or even catapulting themselves over the wall helped them understand. The most amazing place in Berlin, and the one place I would really love to go back to and spend more time at, is the Memorial to the Mudered Jews of Europe. That has got to be the strangest, most unsettling, most haunting monument ever. It’s so difficult to describe that I don’t know if I can do it justice, and to take a picture of it wouldn’t give you the same feeling we felt as we wandered through the memorial. The monument is almost five acres filled with 2,711 rectangular concrete pillars. The pillars are about 8 feet by 3 feet, but vary in height, starting out ankle high, but quickly getting up to almost 16 feet tall. At the same time, the cobblestone ground is uneven, sloping and dipping. The pillars are set up in a grid, so there’s a few feet between each of them to wander around like a maze, in fact, our tour guide told us to head in there and play hide and seek. At first that seemed a bit disrespectful, to run through a memorial to the dead and play a child’s game, but we quickly got his point. Running through that grid, with the varied heights of the pillars and the cobblestone paths rising and falling, unable to see around the corners, never knowing if someone would pop up in front, alongside, or even behind you, was intense. You began to feel claustrophobic and paranoid. I found myself nervous with every step I took, quickly separated from my group, and unable to tell where the “bad guys” were coming from. I’d see them one second, down an aisle 100 feet away, but you could never tell where they’d catch up to you again. The kids felt the same way, and when we all emerged from the memorial many of them claimed to have a better understanding of how the Jews in Germany must have felt in the 1930s and ’40s. A few blocks away from the memorial is the site of Hitler’s palace. It was destroyed and torn down by the Russians at the end of the war, but some of the marble that made up the building was used for a subway station on the other end of town. We got to go down into that station, and even before Bernhardt told us where the marble walls came from, most of the kids claimed that the place felt cold, eerie, and a little spooky. Our first day in Germany was pretty full, so we were all more than ready to head to dinner at that point. We hopped on the bus and all 33 Americans, visiting Germany for the first time, were taken to a Russian restaurant, where we were served Italian food. If you want to read more about that dinner and the hilarious hi-jinks that took place afterwards, check out this post. 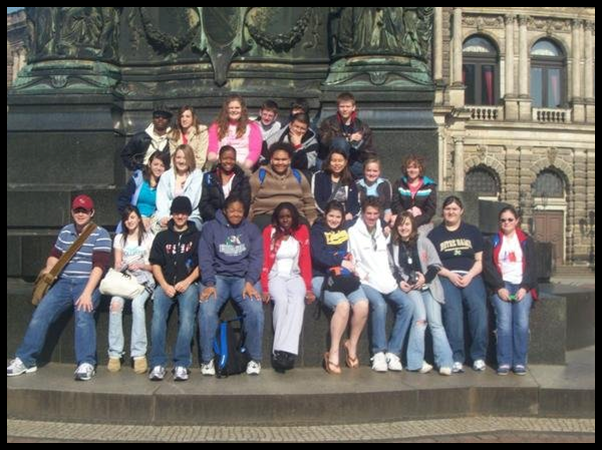 The first group of TAP students outside Semper Opera House in Dresden, Germany. Visiting Dresden was as close as I’ve ever felt to having a time machine. We visited a really strange museum where the highlight was a bunch of faces carved into the cherry stones – and I don’t mean one face on one cherry stone – there was some strange German competition where people tried to see how many tiny faces they could carve into one stone. Bernhardt was incredibly proud of these stones, as if they said something about the German people. To me they did say something about German art, but probably not what Bernhardt wanted. Dresden was an odd city to visit, too. After we’d read all about the Allied bombings that destroyed most of the city in 1945, the whole place had an eerie sort of feel to it. This post describes that feeling. Nuremberg was one of my favorite towns. After the size of Berlin and the manic schedule we had in Dresden, Nuremberg was the first time on the trip that we really had a moment to just stroll around and relax. We arrived right around lunch time, and Bernhardt dropped us off for some free time at the Hauptmarkt, tents and booths set up all throughout the main city square. 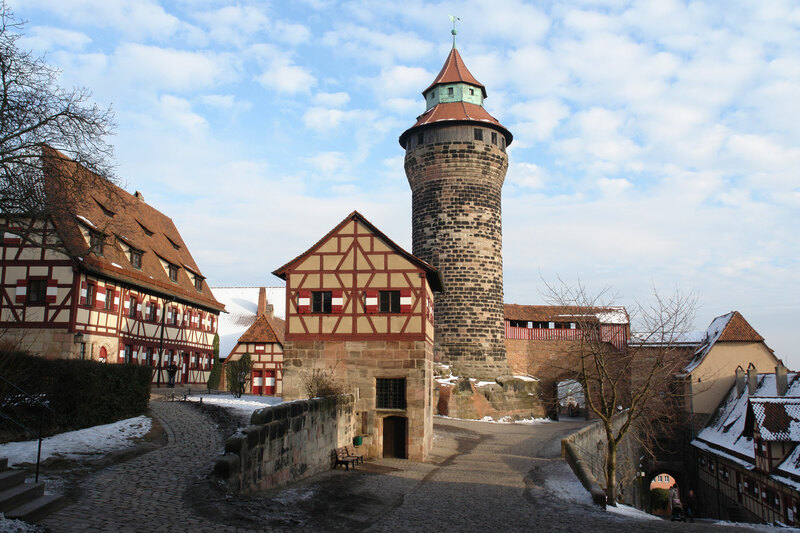 Nuremberg Castle, one of the highlights of the first Minooka TAP trip. We were told that the best way to eat lunch in Nuremberg was to pick and choose the best stuff we could find from the stalls in the market. I’d never done anything like that, but was excited about the chance. I stopped at the first booth and ordered a bratwurst the size of my forearm. The next vendor had bread and rolls, so he sliced open a pretzel roll for me, and the stall after that had about a thousand varieties of mustard, so my giant brat was snug in it’s warm, soft roll and slathered with a spicy brown mustard in mere moments. It still stands as one of the best meals I’ve ever eaten in a foreign country. Kevin, one of the students on the trip, was a notoriously picky eater, but he grabbed a big, soft pretzel that was so enormous he could have used it as a hula hoop. More about awesome food on tour here. We grabbed our lunches to go and split up to explore Nuremberg. About half the group stuck around the square to do some shopping, but the other half stuck with me and trekked on over to Nuremberg Castle. Built into the slopping hillside, with cobblestone paths leading all the way up to it, the castle was the highlight of the day. Well, the bratwurst was better, but you get the idea. Kevin was still eating his pretzel an hour later after we’d explored the courtyard and all three towers. Then, a guide from the castle offered to show us the castle’s best feature – the Deep Well. The guide told us the history of the castle, and in a really cool demonstration, showed us that the well had been dug more than fifty feet down into the rock below us by lowering a candle down into the well. After the castle, the group reconvened and we bussed over to the Zeppelinfeld, a huge field where Hitler used to hold giant rallies to throw his crazy about. The Zeppelinfeld was a field where Zeppelins (blimps) used to land. We actually got to climb up the bleachers and stand in the very spot where Hitler stood while he fired up the masses, only instead of battalions of soldiers and rows of tanks below us, there was a youth soccer league having practices. That was weird to see. Munich is one of my favorite visits of all time. In fact, in 2014, Munich will become the first city that TAP will visit twice (on purpose anyway, we did accidentally visit London once, making two visits to that town). The first stop there was the Glockenspiel, a huge clock in the center of town that has all sorts of mechanical characters telling a huge long story when the clock chimes. Then we visited the famous Hoffbrau Haus. Read more about that experience here. Easily one of the most beautiful places I’ve ever been was Neuschwanstein Castle. It’s said that when Walt Disney toured all of Europe looking for a castle beautiful enough to model Cinderella’s Castle after in DisneyWorld – he found what he was looking for in the Bavarian Alps. The home of King Ludwig II was breathtaking, but so was the climb up to his castle. There were two ways up: The easy way, which was a ridiculously steep, winding, paved path or the hard way – much steeper, straighter, but not even close to paved. The kids, of course, wanted to take that “short cut.” It was not short. You were scrambling over rocks and fallen trees, half the time down on all fours to keep your balance. It was worth it, though, when you go to the top and saw Neuschwanstein peeking through the trees. You can read more about that day here. Time has stood still in Rothenburg. Inside the city walls it looks almost exactly as it did hundreds of years ago. When you’ve traveled to as many cool places as TAP has been lucky enough to, you get asked a lot of questions about your favorites. What was the best trip? What’s your favorite city? What’s the coolest thing you’ve done? What’s the best/weirdest thing you’ve eated? No one ever asks about the most difficult day, or the sickest I’ve ever felt, or the most important thing we’ve done. The answer to those last few questions is undoubtedly Dachau Concentration Camp. It wasn’t cool. It wasn’t fun. I have a hard time even calling it interesting. What it was was important. Without a doubt the hardest day in TAP history. Walking through the camp with three teenage boys from Minooka was hard. It probably would have been even harder alone, but not because you’d want someone to talk to, because I don’t think the four of us said ten words the entire three hours we were inside the camp, you just didn’t want to be alone. Each building made you feel sicker, each story sadder than the last. It was important. I didn’t have any fun, but I’m glad we went there. Rothenburg was a fantastic change of pace after a day in the concentration camp. Rothenburg is a medieval city, still surrounded by the city walls that protected it hundreds of years ago. The cobblestone streets wind through building – homes, churches, storefronts – that are all hundreds of years older than our country. The highlight of the town was circling the entire city from within the walls – peeking out the arrow slits, peering down into the murder holes, pretending enemy forces were rushing across the valley and it was up to us to protect the town. One of the most fun days we’ve ever had. You can see most of Heidelberg from across the river on the Phiosophenweg. 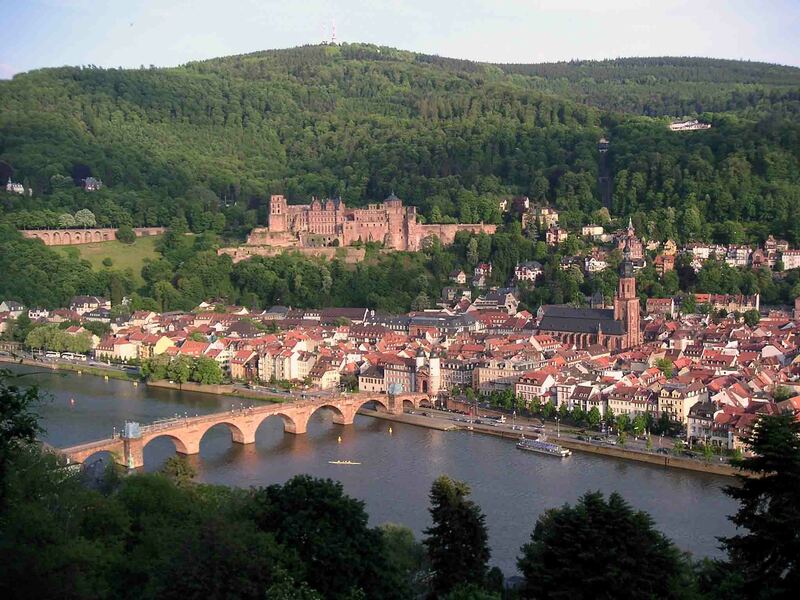 My uncle was stationed in Heidelberg, so I was really looking forward to seeing the town he’d told many stories about. The town didn’t disappoint. It’s situated alongside a river, in a valley between two sets of mountains, with a lone bridge connecting one side of the river to the other. The castle, which is mostly in ruins lies on the edge of the town. That was our first stop. We toured Heidelberg Castle with a guide, telling us stories of all the battles that took place there. Then, during free time, I took some of the boys for a quick lunch and a dash up the church tower in the center of town. It was that day that one of TAP’s primary rules for touring foreign cities was born – try to get as high up as possible in each city. Seeing the whole town from up above was incredible, but a quick look at our map showed that across the river, on the ridge of the hill, there was a path called the Philosophenweg, or Philosopher’s Walk. Supposedly walking that path gave deep thinkers moments of inspiration and clarity, so we trekked over there and hiked our way through the beautiful grape vineyards, up into the woods, and all the way up to a guard tower positioned at the ridge of the hill. One direction we could see an amazing view of the entire town, and the other way we could see a line of guard towers positioned throughout the hills – and we could imagine signal flames being lit at one tower after another to warn the town of invading forces. It was a fantastic moment. Our last day in Germany was spent on a Rhine River Cruise. Castle after castle dotted the landscape along side the river. Hills rolled off in the distance, filled with more and more towers like the one we’d climbed the day before. We noticed right away that every time there was a castle on the right bank, there was another on the left side of the river. You could always tell which side was more powerful by seeing how much of the castle was in ruins compared to it’s counterpart across the water. We ended our cruise with a visit to one of the castles – Burg Rheinfels in St. Goar. We had a bunch more free time to wander around the castle, which was a nice relaxing way to end our German adventure. My group chose to forgo the tower (we’d already done towers) and instead explore the dungeon. The winding tunnels led us deep into the mountainside, turning this way and that. We all felt pretty good about how to get out of there, but we actually needed the light from one boy’s video camera to find our way through in the pitch black. That day another TAP rule for seeing foreign cities was born – always try and get as low as possible. Our German adventure was just 10 days long, but the memories and friendships forged will last a lifetime. At the time, the TAP teachers weren’t sure if we’d ever do another trip again, but on our way to the airport that last day we finally began discussing next year. We were hooked. We were world travelers now, and first adventure may have been over, but chapter two was waiting just around the bend.